Dr. Claire Barnett is an acclaimed mosaic artist, the long-time and treasured mosaic consultant for Nimbus Arts’ Hundreds of Hands program, and a lifelong friend of Jamie Graff. 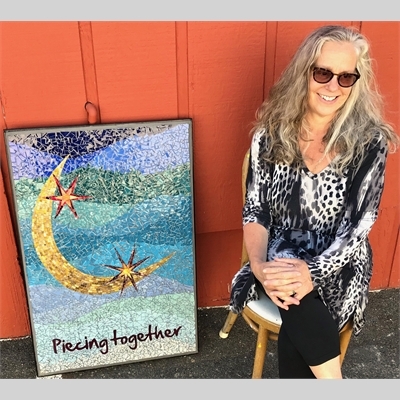 Dr. Barnett combines her 25 years of experience as a family physician with her 15+ years history as both a mosaic artist and a practitioner offering mosaic-making as medicine. Claire will present a fascinating exploration of the neurobiology of mosaic-making. She will share her therapeutic experience and delve into the roles that different parts of the brain play in the processing of information and emotions through creative activity, especially in the face of trauma and grief.